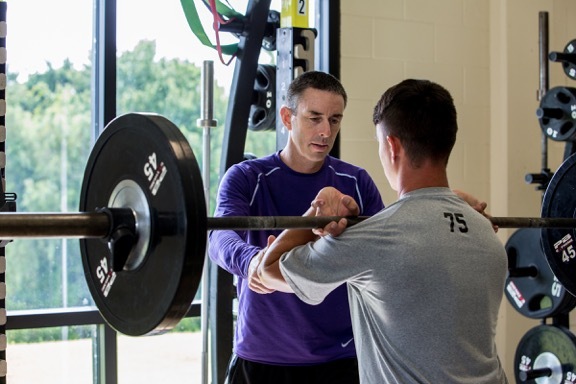 Tim is the Head Strength and Conditioning Coach at Montverde Academy in Montverde Fl. He is responsible for the training and conditioning for all varsity and academy sports. In his 5 years, MVA teams have won 9 National Championships and numerous state titles. He has coached athletes who are playing in the NBA, Major League Soccer, and European Pro Soccer. Tim is a graduate of Springfield College in Athletic Training. He was a 2008 Olympic Triathlon coach. He has coached athletes to World Championships, Ironman Championships and numerous National Championships. Tim is a frequent speaker at Clinics and conferences including NSCA and USA Triathlon. He has written many article that have appeared in major sports publication, including Training and Conditioning, Inside Triathlon, Triathlete Magazine, Triathlon Europe, and Master Skier. Tim was the 2009 USA Triathlon Elite Coach of the Year, and 2007 USA Triathlon Development Coach of the Year. He holds Elite coaching licenses with USA Triathlon and USA Cycling, as well as certifications with National Strength and Conditioning, American Swim Coaches Association and National Academy of Sports Medicine. The Mission of TC2 Coaching is to bring High performance coaching and training products to athletes of all abilities who have the desire to pursue their athletic goals and dreams.